Also Recommended: Kino's Journey, Natsume Yuujinchou. Notes: Based on the manga by Yuki Urushibara, published by Kodansha, licensed and released in English by Del Rey. Ginko is a mushi master, travelling the world studying mushi. On his journey, he becomes involved with people from various villages and the mushi that influence them. Originality is a hard thing to come by these days. Which is not to say that a show needs to be original to be good, or that a show is good because it's original. It's a word as subjective as "quality". To be sure, Mushishi certainly is an original show. Not because of its mostly languid pace, but because it might very well be the first anime I've ever watched that has partially felt like a documentary. To put it in perspective; if David Attenborough somehow ended up doing a voiceover for this show, I would probably not bat an eye. The reason for this; the core of the show, as its name implies, is centered around the mushi, described as "life in its purest form". The mushi do not take a single shape; their shapes, abilities and lifestyles are as diverse as insects, and then some. Not a whole lot is known about them, which is part of the reason why Ginko travel; he wants to learn. To the viewer, they are just as big a mystery, and an interesting one at that. Their diversity means that there are harmless ones, but also ones that can cause great harm to a human being. (Though not for malicious reasons -- they're just trying to survive and live, much like anyone... or anything else.) Many of them grant abilities beyond the human norm, some of which may have unfortunate consequences. But the bottom line is this; the mushi are a life form. As such, Ginko's journey of learning isn't solely centered around "dealing" with them as one would a disease. This multifaceted lesson makes Mushishi a fascinating show. Ginko encounter a LOT of mushi, and while each episode make it clear how the mushi influence the surroundings and, potentially, the people living there, we do not necessarily learn everything that is to know about them. The temporary stops on Ginko's travels won't always answer everything, and more often than not, the knowledge Ginko has already attained will be the deciding factor. 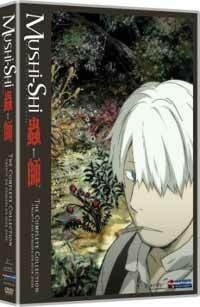 If there is one downside to Mushishi, then the human cast doesn't always come through. Seeing as Ginko travels from place to place, we don't really get a whole lot of recurring character appearances, and the ones that do are often somewhat underdeveloped, which will make occasional episodes feel emotionally distant. Facial structures are also rather simple, which makes characters resemble each other more often than not, which also makes it hard to get attached to the characters Ginko meets on his travels. I wouldn't go so far as to say it hurts the show, but I noticed it all the same. I have no complaints about the atmosphere, though; from Ally Kerr's gentle opener "The Sore Feet Song", the opening leads into a gently animated piece set in pastoral surroundings in the rural countryside of (possibly) Japan. Mushishi is the greenest show I have ever seen, though we will occasionally see Ginko wander through some of the most spectacular snowfalls I've seen in anime. It's all set to the beautiful score of Toshio Masuda, who's also responsible for the music in... uh... Excel Saga? Hand Maid May? I... don't see the connection. I did try watch this show many years ago, long before it was licensed. I'm not entirely sure, but the aforementioned emotional detachment might have been what made me stop watching it. (The disturbing imagery in the second episode probably didn't help either.) And so, this show was laid to rest until now. Make no mistake about it; this is a great show. The mushi are a wonderfully realized and well thought out lifeform that enriches the whole experience. It's a shame the human cast doesn't always live up to it, but this is a relatively minor grievance, and a somewhat personal one at that. Time spent on Mushishi is always worth it. Recommended Audience: There is little to no violence in Mushishi, and fanservice is all but nonexistant. The mushi can and will occasionally cause some disturbing visual imagery, though, mostly by pouring out of human orifices, like the eye sockets. It doesn't happen often, but it does occasionally.